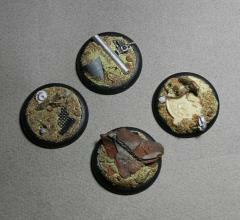 4 resin round bases. Diameter 40mm with rounded hedges. Depicting a piece of aftermath wasteland. Suits perfectly for their EDEN Bamakas theme. Ideal scenery for Sci-Fi, Steam punk or post apocalyptic miniatures (scale 28 to 32mm).